Richard Buckminster “Bucky” Fuller (July 12, 1895 – July 1, 1983) was an American engineer, author, designer, inventor, and futurist. Fuller published more than 30 books, inventing and popularizing terms such as "Spaceship Earth", ephemeralization, and synergetics. He also developed numerous inventions, mainly architectural designs, the best known of which is the geodesic dome. Carbon molecules known as fullerenes were later named by scientists for their resemblance to geodesic spheres. Years later, he decided that this sort of experience had provided him with not only an interest in design, but also a habit of being familiar with and knowledgeable about the materials that his later projects would require. Fuller earned a machinist's certification, and knew how to use the press brake, stretch press, and other tools and equipment used in the sheet metal trade. Fuller was sent to Milton Academy, in Massachusetts, and after that, began studying at Harvard. He was expelled from Harvard twice: first for spending all his money partying with a vaudeville troupe, and then, after having been readmitted, for his "irresponsibility and lack of interest." By his own appraisal, he was a non-conforming misfit in the fraternity environment. It was to be many years before he received a Sc.D. from Bates College in Lewiston, Maine. Between his sessions at Harvard, Fuller worked in Canada as a mechanic in a textile mill, and later as a labourer for the meat-packing industry. He also served in the U.S. Navy in World War I, as a shipboard radio operator, as an editor of a publication, and as a crash-boat commander. After discharge, he worked again for the meat packing industry, thereby acquiring management experience. In 1917, he married Anne Hewlett. During the early 1920s, he and his father-in-law developed the Stockade Building System for producing light-weight, weatherproof, and fireproof housing — although the company would ultimately fail. By age 32, Fuller was bankrupt and jobless, living in public, low-income housing in Chicago, Illinois. In 1922, Fuller's young daughter Alexandra died from complications from polio and spinal meningitis. Allegedly, he felt responsible and this caused him to drink frequently and to contemplate suicide for a while. He finally chose to embark on "an experiment, to find what a single individual [could] contribute to changing the world and benefiting all humanity." By 1928, Fuller was living in Greenwich Village and spending much of his time at the popular café Romany Marie's, where he had spent an evening in conversation with Marie and Eugene O'Neill several years earlier. Fuller accepted a job decorating the interior of the café in exchange for meals, giving informal lectures several times a week, and models of the Dymaxion house were exhibited at the café. Isamu Noguchi arrived during 1929 — Constantin Brâncuşi, an old friend of Marie's, had directed him there — and Noguchi and Fuller were soon collaborating on several projects, including the modeling of the Dymaxion car. It was the beginning of their lifelong friendship. Fuller taught at Black Mountain College in North Carolina during the summers of 1948 and 1949, serving as its Summer Institute director in 1949. There, with the support of a group of professors and students, he began reinventing a project that would make him famous: the geodesic dome. Although the geodesic dome had been created some 30 years earlier by Dr. Walther Bauersfeld, Fuller was awarded United States patents. He is credited for popularizing this type of structure. One of his early models was first constructed in 1945 at Bennington College in Vermont, where he frequently lectured. During 1949, he erected his first geodesic dome building that could sustain its own weight with no practical limits. It was 4.3 meters (14 ft) in diameter and constructed of aluminum aircraft tubing and a vinyl-plastic skin, in the form of an icosahedron. To prove his design, and to awe non-believers, Fuller suspended from the structure's framework several students who had helped him build it. The U.S. government recognized the importance of his work, and employed his firm Geodesics, Inc. in Raleigh, North Carolina to make small domes for the army. Within a few years there were thousands of these domes around the world. For the next half-century, Fuller developed many ideas, designs and inventions, particularly regarding practical, inexpensive shelter and transportation. He documented his life, philosophy and ideas scrupulously by a daily diary (later called the Dymaxion Chronofile), and by twenty-eight publications. Fuller financed some of his experiments with inherited funds, sometimes augmented by funds invested by his collaborators, one example being the Dymaxion car project. International recognition began with the success of his huge geodesic domes during the 1950s. Fuller taught at Washington University in St. Louis in 1955, where he met James Fitzgibbon, who would become a close friend and colleague. From 1959 to 1970, Fuller taught at Southern Illinois University Carbondale. Beginning as an assistant professor, he gained full professorship during 1968, in the School of Art and Design. Working as a designer, scientist, developer, and writer, he lectured for many years around the world. He collaborated at SIU with the designer John McHale. During 1965, Fuller inaugurated the World Design Science Decade (1965 to 1975) at the meeting of the International Union of Architects in Paris, which was, in his own words, devoted to "applying the principles of science to solving the problems of humanity." Fuller believed human societies would soon rely mainly on renewable sources of energy, such as solar- and wind-derived electricity. He hoped for an age of "omni-successful education and sustenance of all humanity." For his lifetime of work, the American Humanist Association named him the 1969 Humanist of the Year. Fuller was awarded 28 United States patents and many honorary doctorates. In 1960, he was awarded the Frank P. Brown Medal from The Franklin Institute. On January 16, 1970, he received the Gold Medal award from the American Institute of Architects. He also received numerous other awards, including the Presidential Medal of Freedom presented to him on February 23, 1983 by President Ronald Reagan. Fuller's last filmed interview took place on April 3, 1983, in which he presented his analysis of Simon Rodia's Watts Towers as a unique embodiment of the structural principles found in nature. Portions of this interview appear in I Build the Tower, a documentary film on Rodia's architectural masterpiece. Fuller died on July 1, 1983, 11 days before his 88th birthday. During the period leading up to his death, his wife had been lying comatose in a Los Angeles hospital, dying of cancer. It was while visiting her there that he exclaimed, at a certain point: "She is squeezing my hand!" He then stood up, suffered a heart attack, and died an hour later, at age 87. His wife of 66 years died 36 hours later. They are buried in Mount Auburn Cemetery in Cambridge, Massachusetts. The grandson of a Unitarian minister (Arthur Buckminster Fuller), R. Buckminster Fuller was also Unitarian. Buckminster Fuller was an early environmental activist. He was very aware of the finite resources the planet has to offer, and promoted a principle that he termed "ephemeralization", which, in essence — according to futurist and Fuller disciple Stewart Brand — Fuller coined to mean "doing more with less". Resources and waste material from cruder products could be recycled into making more valuable products, increasing the efficiency of the entire process. Fuller also introduced synergetics, an encompassing term which he used broadly as a metaphoric language for communicating experiences using geometric concepts and, more specifically, to reference the empirical study of systems in transformation, with an emphasis on total system behavior unpredicted by the behavior of any isolated components. Fuller coined this term long before the term synergy became popular. Buckminster Fuller was one of the first to propagate a systemic worldview, and he explored principles of energy and material efficiency in the fields of architecture, engineering and design. He cited François de Chardenedes' opinion that petroleum, from the standpoint of its replacement cost out of our current energy "budget" (essentially, the net incoming solar flux), had cost nature "over a million dollars" per U.S. gallon (US$300,000 per litre) to produce. From this point of view, its use as a transportation fuel by people commuting to work represents a huge net loss compared to their earnings. An encapsulation quotation of his views might be, "There is no energy crisis, only a crisis of ignorance." Fuller was concerned about sustainability and about human survival under the existing socio-economic system, yet remained optimistic about humanity's future. Defining wealth in terms of knowledge, as the "technological ability to protect, nurture, support, and accommodate all growth needs of life," his analysis of the condition of "Spaceship Earth" caused him to conclude that at a certain time during the 1970s, humanity had attained an unprecedented state. He was convinced that the accumulation of relevant knowledge, combined with the quantities of major recyclable resources that had already been extracted from the earth, had attained a critical level, such that competition for necessities was not necessary anymore. Cooperation had become the optimum survival strategy. "Selfishness," he declared, "is unnecessary and hence-forth unrationalizable.... War is obsolete." He criticized previous utopian schemes as too exclusive, and thought this was a major source of their failure. To work, he thought that a utopia needed to include everyone. Fuller also claimed that the natural analytic geometry of the universe was based on arrays of tetrahedra. He developed this in several ways, from the close-packing of spheres and the number of compressive or tensile members required to stabilize an object in space. One confirming result was that the strongest possible homogeneous truss is cyclically tetrahedral. In his 1970 book I Seem To Be a Verb, he wrote: "I live on Earth at present, and I don't know what I am. I know that I am not a category. I am not a thing — a noun. I seem to be a verb, an evolutionary process — an integral function of the universe." He had become a guru of the design, architecture, and 'alternative' communities, such as Drop City, the community of experimental artists to whom he awarded the 1966 "Dymaxion Award" for "poetically economic" domed living structures. A geodesic sphere and its dual. An examination of the geodesic design by Bauersfeld for the Zeiss Planetarium, built some 20 years prior to Fuller's work, reveals that Fuller's Geodesic Dome patent (U.S. 2,682,235) follows the same methodology as Bauersfeld's design. Their construction is based on extending some basic principles to build simple "tensegrity" structures (tetrahedron, octahedron, and the closest packing of spheres), making them lightweight and stable. The patent for geodesic domes was awarded during 1954, part of Fuller's exploration of nature's constructing principles to find design solutions. The Fuller Dome is referenced in the Hugo Award-winning novel Stand on Zanzibar by John Brunner, in which a geodesic dome is said to cover the entire island of Manhattan, and it floats on air due to the hot-air balloon effect of the large air-mass under the dome (and perhaps its construction of lightweight materials). In the 1930s, Fuller designed and built prototypes of what he hoped would be a safer, aerodynamic car, which he called the Dymaxion. ("Dymaxion" is said to be a syllabic abbreviation of dynamic maximum tension, or possibly of dynamic maximum ion.) Fuller worked with professional colleagues for three years beginning in 1932 on a design idea Fuller had derived from aircraft technologies. The three prototype cars were different from anything being sold at the time. They had three wheels: two front drive wheels and one rear, steered wheel. The engine was in the rear, and the chassis and body were original designs. The aerodynamic, somewhat tear-shaped body was large enough to seat eleven people and was about 18 feet (5.5 m) long, resembling a blend of a light aircraft (without wings) and a Volkswagen van of 1950s vintage. All three prototypes were essentially a mini-bus, and its concept long predated the Volkswagen Type 2 mini-bus conceived in 1947 by Ben Pon. Despite its length, and due to its three-wheel design, the Dymaxion turned on a small radius and could easily be parked in a tight space. The prototypes were efficient in fuel consumption for their day, traveling about 30 miles per gallon. Fuller contributed a great deal of his own money to the project, in addition to funds from one of his professional collaborators. An industrial investor was also very interested in the concept. Fuller anticipated the cars could travel on an open highway safely at up to about 160 km/h (100 miles per hour), but, in practise, they were difficult to control and steer above 80 km/h (50 mph). Investors backed out and research ended after one of the prototypes was involved in a high-profile collision that resulted in a fatality. In 2007, Time Magazine reported on the Dymaxion as one of the "50 worst cars of all time". In 1943, industrialist Henry J. Kaiser asked Fuller to develop a prototype for a smaller car, but Fuller's five-seater design was never developed further. A Dymaxion House at The Henry Ford. Fuller's energy-efficient and inexpensive Dymaxion House garnered much interest, but has never been produced. Here the term "Dymaxion" is used in effect to signify a "radically strong and light tensegrity structure". One of Fuller's Dymaxion Houses is on display as a permanent exhibit at The Henry Ford in Dearborn, Michigan. Designed and developed during the mid-1940s, this prototype is a round structure (not a dome), shaped something like the flattened "bell" of certain jellyfish. It has several innovative features, including revolving dresser drawers, and a fine-mist shower that reduces water consumption. According to Fuller biographer Steve Crooks, the house was designed to be delivered in two cylindrical packages, with interior color panels available at local dealers. A circular structure at the top of the house was designed to rotate around a central mast to use natural winds for cooling and air circulation. Conceived nearly two decades before, and developed in Wichita, Kansas, the house was designed to be lightweight and adapted to windy climates. It was to be inexpensive to produce and purchase, and assembled easily. It was to be produced using factories, workers and technologies that had produced World War II aircraft. It was ultramodern-looking at the time, built of metal, and sheathed in polished aluminum. The basic model enclosed 90 m² (1000 square feet) of floor area. Due to publicity, there were many orders during the early Post-War years, but the company that Fuller and others had formed to produce the houses failed due to management problems. During 1969, Fuller began the Otisco Project, named after its location in Otisco, New York. The project developed and demonstrated concrete spray technology used in conjunction with mesh covered wireforms as a viable means of producing large scale, load bearing spanning structures built on site without the use of pouring molds, other adjacent surfaces or hoisting. The initial construction method used a circular concrete footing in which anchor posts were set. Tubes cut to length and with ends flattened were then bolted together to form a duodeca-rhombicahedron (22 sided hemisphere) geodesic structure with spans ranging to 60 feet (18 m). The form was then draped with layers of ¼-inch wire mesh attached by twist ties. Concrete was then sprayed onto the structure, building up a solid layer which, when cured, would support additional concrete to be added by a variety of traditional means. Fuller referred to these buildings as monolithic ferroconcrete geodesic domes. The tubular frame form proved too problematic when it came to setting windows and doors, and was abandoned. The second method used iron rebar set vertically in the concrete footing and then bent inward and welded in place to create the dome's wireform structure and performed satisfactorily. Domes up to three stories tall built with this method proved to be remarkably strong. Other shapes such as cones, pyramids and arches proved equally adaptable. The project was enabled by a grant underwritten by Syracuse University and sponsored by US Steel (rebar), the Johnson Wire Corp, (mesh) and Portland Cement Company (concrete). The ability to build large complex load bearing concrete spanning structures in free space would open many possibilities in architecture, and is considered as one of Fuller's greatest contributions. Fuller also designed an alternative projection map, called the Dymaxion map. This was designed to show Earth's continents with minimum distortion when projected or printed on a flat surface. Fuller was a frequent flier, often crossing time zones. He famously wore three watches; one for the current zone, one for the zone he had departed, and one for the zone he was going to. In this respect he follows the jazz drummer Buddy Rich, who in the Pete Atkin / Clive James song “The Wristwatch for a Drummer”, also “wears three, one on the right wrist, one on the left, and the third one around his knee”. The wristwatch in question is the imagined “Omega Incabloc Oyster Accutron 72” for which “Buckminster Fuller designed the case”  Fuller also noted that a single sheet of newsprint, inserted over a shirt and under a suit jacket, provided completely effective heat insulation during long flights. Seagaia Ocean Dome: Miyazaki, Japan, 216 m (710 ft). Multi-Purpose Arena: Nagoya, Japan, 187 m (614 ft). Tacoma Dome: Tacoma, Washington, USA, 162 m (530 ft). Superior Dome: Northern Michigan Univ. Marquette, Michigan, USA, 160 m (525 ft). Walkup Skydome: Northern Arizona Univ. Flagstaff, Arizona, USA, 153 m (502 ft). Poliedro de Caracas: Caracas, Venezuela, 145 m (475 ft). Round Valley High School Stadium: Springerville-Eagar, Arizona, USA, 134 m (440 ft). Former Spruce Goose Hangar: Long Beach, California, USA, 126 m (415 ft). Formosa Plastics Storage Facility: Mai Liao, Taiwan, 123 m (402 ft). Union Tank Car Maintenance Facility: Baton Rouge, Louisiana USA, 117 m (384 ft), destroyed in November 2007. Lehigh Portland Cement Storage Facility: Union Bridge, Maryland USA, 114 m (374 ft). The Gold Dome in Oklahoma City, formerly a bank and now a multicultural society and business center. Downtown Vancouver, British Columbia, is a geodesic sphere hosting the Telus World of Science, a science centre (formerly called Science World), that was originally the Expo Centre built for Expo 86. The dome enclosing a civic center in Stockholm, Sweden, 85.3-meter (280 ft) high. The world's largest aluminum dome formerly housed the “Spruce Goose” airplane in Long Beach Harbor, California. However, contrary to Fuller's hopes, domes are not an everyday sight in most places. In practice, most of the smaller owner-built geodesic structures had disadvantages (see geodesic domes), including their unconventional appearance. An interesting spin-off of Fuller's dome-design conceptualization was the Buckminster Ball, which was the official FIFA approved design for footballs (association football), from their introduction at the 1970 World Cup until recently. The design was a truncated icosahedron -- essentially a "Geodesic Sphere", consisting of 12 pentagonal and 20 hexagonal panels. This was used continuously for 34 years until replaced by the 14-panel Teamgeist for the 2006 World Cup. Fuller was followed (historically) by other designers and architects, such as Sir Norman Foster and Steve Baer, willing to explore the possibilities of new geometries in the design of buildings, not based on conventional rectangles. He experimented with polyphasic sleep, which he called Dymaxion sleep. In 1943, he told Time Magazine that he had slept only two hours a day for two years. He quit the schedule because it conflicted with his business associates' sleep habits, but stated that Dymaxion sleep could help the United States win World War II. An allotrope of carbon - fullerene, and a particular molecule of that allotrope C60 (buckminsterfullerene or buckyball) has been named after him. The Buckminsterfullerene molecule, which consists of 60 carbon atoms, very closely resembles a spherical version of Fuller's geodesic dome. The 1996 Nobel prize in chemistry was given to Kroto, Curl, and Smalley for their discovery of the fullerene. On July 12, 2004, the United States Post Office released a new commemorative stamp honoring R. Buckminster Fuller on the 50th anniversary of his patent for the geodesic dome and by the occasion of his 109th birthday. Fuller documented his life copiously from 1915 to 1983, approximately 270 feet (82 m) of papers in a collection called the Dymaxion Chronofile. He also kept copies of all ingoing and outgoing correspondence. The enormous Fuller Collection is currently housed at Stanford University. If somebody kept a very accurate record of a human being, going through the era from the Gay 90s, from a very different kind of world through the turn of the century — as far into the twentieth century as you might live. I decided to make myself a good case history of such a human being and it meant that I could not be judge of what was valid to put in or not. I must put everything in, so I started a very rigorous record. 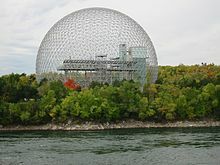 He dedicated the US Pavilion dome at Expo 67 to his wife Anne when they celebrated their 50th wedding anniversary there. Around 1979-1980, Bucky shared a lecture tour across America with philosopher Werner Erhard. 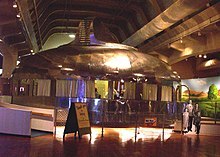 In 2005, American country rock music performer Jason Ringenberg recorded 'Buckminster Fuller We Need You Now' in Fuller's Carbondale, Illinois dome. Fuller was the subject of two documentary films: The World of Buckminster Fuller (1971) and Buckminster Fuller: Thinking Out Loud (1996). During June 2008, the Whitney Museum of American Art presented Buckminster Fuller: Starting with the Universe, the most comprehensive retrospective to date of his work and ideas. British singer-songwriter Nerina Pallot released The Buckminster Fuller EP, featuring a song of the same name, in 2009. During 2008, Belgian Rockband dEUS devoted the song "The Architect" on their album "Vantage Point" to Buckminster Fuller. Buckminster Fuller spoke and wrote in a unique style and said it was important to describe the world as accurately as possible. Fuller often created long run-on sentences and used unusual compound words (omniwell-informed, intertransformative, omni-interaccommodative, omniself-regenerative) as well as terms he himself invented. "World-around" is a term coined by Fuller to replace "worldwide". The general belief in a flat Earth died out in Classical antiquity, so using "wide" is an anachronism when referring to the surface of the Earth — a spheroidal surface has area and encloses a volume but has no width. Fuller held that unthinking use of obsolete scientific ideas detracts from and misleads intuition. Other neologisms collectively invented by the Fuller family, according to Allegra Fuller Snyder, are the terms sunsight and sunclipse, replacing sunrise and sunset to overturn the geocentric bias of most pre-Copernican celestial mechanics. Fuller also invented the word "livingry," as opposed to weaponry (or "killingry"), to mean that which is in support of all human, plant, and Earth life. "The architectural profession — civil, naval, aeronautical, and astronautical — has always been the place where the most competent thinking is conducted regarding livingry, as opposed to weaponry." As well as contributing significantly to the development of tensegrity technology, Fuller invented the term "tensegrity" from tensional integrity. "Tensegrity describes a structural-relationship principle in which structural shape is guaranteed by the finitely closed, comprehensively continuous, tensional behaviors of the system and not by the discontinuous and exclusively local compressional member behaviors. Tensegrity provides the ability to yield increasingly without ultimately breaking or coming asunder." "Dymaxion", is a portmanteau of "Dynamic maximum tension". It was invented by an adman about 1929 at Marshall Field's department store in Chicago to describe Fuller's concept house, which was shown as part of a house of the future store display. These were three words that Fuller used repeatedly to describe his design. Fuller also helped to popularise the concept of Spaceship Earth: "The most important fact about Spaceship Earth: an instruction manual didn't come with it." Among the many people who were influenced by Buckminster Fuller are: Constance Abernathy, Ruth Asawa, J. Baldwin, Michael Ben-Eli, Pierre Cabrol, Joseph Clinton, Peter Floyd, Jacque Fresco, Medard Gabel, Mark Victor Hansen, Michael Hays, David Johnston, Robert Kiyosaki, Peter Pearce, Shoji Sadao, Edwin Schlossberg, Kenneth Snelson, Robert Williams, and Robert Anton Wilson. ^ Encyclopædia Britannica. (2007). "Fuller, R Buckminster". Encyclopædia Britannica Online. http://www.britannica.com/ebc/article-9365050. Retrieved 2007-04-20. ^ a b c Pawley, Martin (1991). Buckminster Fuller. New York: Taplinger. ISBN 0-8008-1116-X. ^ a b c John Haber. "Before Buckyballs". Review of Noguchi Museum Best of Friends exhibit (May 19, 2006 – October 15, 2006). http://www.haberarts.com/fuller.htm. "Noguchi, then twenty-five, had already had enough influences for a lifetime — from birth in Los Angeles, to childhood in Japan and the Midwest, to premedical classes at Columbia, to academic sculpture on the Lower East Side, to Brancusi's circle in Paris. Now his exposure to Modernism and "the American century" received a decidedly New York influence. "Only two years before, on the brink of suicide, Fuller had decided to remake his life and the world. Why not begin on Minetta Street? In 1929, he was shopping around his first major design, plans for an inexpensive, modular home that others air-lift right where desired. Now, in exchange for meals, he took on the interior decoration and chairs for Marie's new location. He must have stood out in person, too, ever the talkative, handsome visionary in tie and starched collar." See also: "The Architect and the Sculptor: A Friendship of Ideas". Grace Glueck, The New York Times. May 19, 2006. http://www.nytimes.com/2006/05/19/arts/design/19nogu.html. Retrieved April 27, 2010. " ^ a b Lloyd Steven Sieden. Buckminster Fuller's Universe: His Life and Work (pp. 74, 119-142). New York: Perseus Books Group, 2000. ISBN 0-73820-379-3. p. 74: "Although O'Neill soon became well known as a major American playwright, it was Romany Marie who would significantly influence Bucky, becoming his close friend and confidante during the most difficult years of his life." ^ a b John Haskell. "Buckminster Fuller and Isamu Noguchi". Kraine Gallery Bar Lit, Fall 2007. http://www.kgbbar.com/lit/features/buckminster_ful.html. ^ Robert Schulman. Romany Marie: The Queen of Greenwich Village (pp. 85–86, 109–110). Louisville: Butler Books, 2006. ISBN 1-88453-274-8. ^ "Interview with Isamu Noguchi". Conducted November 7, 1973 by Paul Cummings at Noguchi's studio in Long Island City, Queens. Smithsonian Archives of American Art. http://www.aaa.si.edu/collections/oralhistories/tranSCRIPTs/noguch73.htm. ^ Michael John Gorman (updated March 12, 2002). "Passenger Files: Isamu Noguchi, 1904–1988". Towards a cultural history of Buckminster Fuller's Dymaxion Car. Stanford Humanities Lab. http://hotgates.stanford.edu/Bucky/dymaxion/noguchi.htm. Includes several images. ^ "IDEAS + INVENTIONS: Buckminster Fuller and Black Mountain College". Black Mountain College Museum and Arts Center Exhibit. July 15, 2005 – November 26, 2005. http://blackmountaincollege.org/content/view/45/60/. ^ Brand, Stewart (1999). The Clock of the Long Now. New York: Basic. ISBN 046504512X. ^ Fuller, R. Buckminster (1969). Operating Manual for Spaceship Earth. Carbondale, IL: Southern Illinois University Press. ISBN 080932461X. ^ Fuller, R. Buckminster; Applewhite, E. J. (1975). Synergetics. New York: Macmillan. ISBN 002541870X. ^ Fuller, R. Buckminster (1981). Critical Path. New York: St. Martin's Press. xxxiv-xxxv. ISBN 0312174888. ^ Fuller, R. Buckminster (1981). "Introduction". Critical Path (First ed.). New York, N.Y.: St.Martin's Press. xxv. ISBN 0-312-17488-8. ""It no longer has to be you or me. Selfishness is unnecessary and hence-forth unrationalizable as mandated by survival. War is obsolete." ^ Fuller, R. Buckminster (2008). Jaime Snyder. ed. Utopia or oblivion: the prospects for humanity. Baden, Switzerland: Lars Müller Publishers. ISBN 9783037781272. ^ "The 50 Worst Cars of All Time"
^ Fuller, Buckminster (1969). Operating Manual for Spaceship Earth. Carbondale: Southern Illinois University Press. ISBN 080932461X. ^ "Science: Dymaxion Sleep". Time. October 11, 1943. http://www.time.com/time/magazine/article/0,9171,774680,00.html. Retrieved April 27, 2010. ^ He wrote a single unpunctuated sentence approximately 3000 words long titled "What I Am Trying to Do." And It Came to Pass - Not to Stay Macmillan Publishing, New York, 1976. ^ Critical Path, page xxv. Chu, Hsiao-Yun. "Fuller's Laboratory Notebook." Collections, Volume 4 Issue 4 Fall 2008 (Lanham, MD: Altamira Press), 295-306. Hatch, Alden Buckminster Fuller At Home In The Universe. 1974 (ISBN 0-440-04408-1) Crown Publishers, New York. Hoogenboom, Olive (1999). "Fuller, R. Buckminster". American National Biography. 8. New York: Oxford University Press. pp. 559–562. McHale, John. R. Buckminster Fuller. George Brazillier, Inc., New York. hardback. 1962. Robertson, Donald. Mind's Eye Of Buckminster Fuller. 1974 (ISBN 0-533-01017-9) Vantage Press, Inc., New York. Sieden, Lloyd. Buckminster Fuller's Universe, His Life and Work. 1989 (ISBN 0-7382-0379-3), explores Fuller's personal life, his beliefs and drives. Sterngold, James. "The Love Song of R. Buckminster Fuller." The New York Times [Arts Section], 15 June 2008. Wong, Yunn Chii, The Geodesic Works of Richard Buckminster Fuller, 1948-1968 (The Universe as a Home of Man), Ph.D. thesis, Cambridge, Massachusetts: Massachusetts Institute of Technology, Department of Architecture, 1999. Clara Thomas Archives and Special Collections, York University - Archival photographs of Buckminster Fuller from the Toronto Telegram. The "Everything I Know" 42-hour lecture session — video, audio, and full transcripts.